Neighborhood main streets and residential streets alike can be enhanced with simple measures, making the most of available transit improvements in often narrow rights-of-way. Boarding bulbs and other streetscape measures improve transit reliability, provide upgrades to the pedestrian realm, support the street as a living space, and improve safety for all users by moderating traffic speeds. 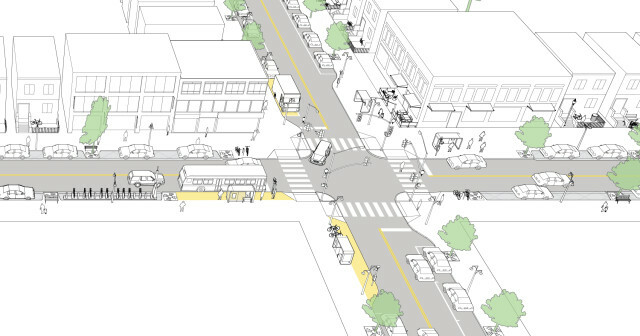 A combination of street design and operation measures, especially Transit Signal Priority (TSP) and boarding bulbs or islands, can provide benefits where transit is a moderate priority, or where more robust measures like dedicated transit lanes cannot fit. Facilitating in-lane stops with boarding bulbs or islands allows buses to remain in a priority position in the street while at stops. Design stops and stations for the expected peak boarding volumes, when passenger impacts on sidewalk conditions are highest. Near-level boarding platforms, complementary with all-door boarding, reduce dwell time and improve operational efficiency. Boarding bulbs create space for transit shelters even where sidewalk space is limited, contributing to higher-visibility service. Bulbs have safety benefits, including improved sightlines that allow bus drivers to see waiting passengers more easily, prevention of high-speed turns, and shorter pedestrian crossing distances. These facilitate shorter signal cycles, bringing general traffic progression in line with bus speeds and potentially improving travel time for several modes. Along signal controlled corridors, alternating between near-side and far-side stop placement may help balance the signal progression around planned stops; the bus can arrive at a far-side stop near the end of green phases, and arrive at the subsequent near-side stop during a red phase. Site stops for easy transfer at transit route intersections. Stops should be near-side at stop-controlled intersections (see Stop Placement & Intersection Configuration). Speed cushions can calm vehicle traffic without adversely affecting transit vehicles. As buses’ wheels are spaced more widely than those on cars, these elements should be built to a width that allows bus tires to straddle and pass over the cushion. Speed cushions have less of an impact calming traffic speeds compared to speed humps, but research has found that bus drivers experience less stress and experience minimal (if any) delay crossing over. Johnson & Nedzesky. A Comparative Study of Speed Humps, Speed Slots and Speed Cushions (2004). Turn bays or restrictions may be applied at intersections of larger streets where delay is common. Manage curbside activities. Consider implementing or modifying meter pricing as a method to better allocate scarce space. Dynamic (or “smart”) parking systems have been shown to provide a small but steady supply of available parking near businesses, reducing the need for vehicles to circle in search of parking. A pilot smart parking program in San Francisco found that dynamic pricing reduced average search times by 43%, and doubled the frequency with which blocks met their parking occupancy targets. Additionally, traffic speed improved on piloted corridors, and VMT decreased daily. SFPark Pilot Project Evaluation. San Francisco Municipal Transportation Agency (2014). Designated freight loading zones relieve the loading and double-parking conflicts that frequently inhibit transit service, while providing essential business access. Freight deliveries may also be limited to off-peak periods. Integrate stormwater management and other green infrastructure on neighborhood streets. Electric or hybrid buses and streetcars have smoother and quieter acceleration, making them friendlier in smaller-scaled or residential streetscapes. Use transit stops as mobility hubs, placing bike share or car share stations within the sightlines of alighting passengers. References for Enhanced Neighborhood Transit Street: 2 found. Johnson, LaToya and AJ Nedzesky. "A Comparative Study of Speed Humps, Speed Slots and Speed Cushions." ITE Annual Meeting, Institute of Transportation Engineers, Washington. SFMTA. "SFPark Pilot Project Evaluation." San Francisco Municipal Transportation Agency, San Francisco.